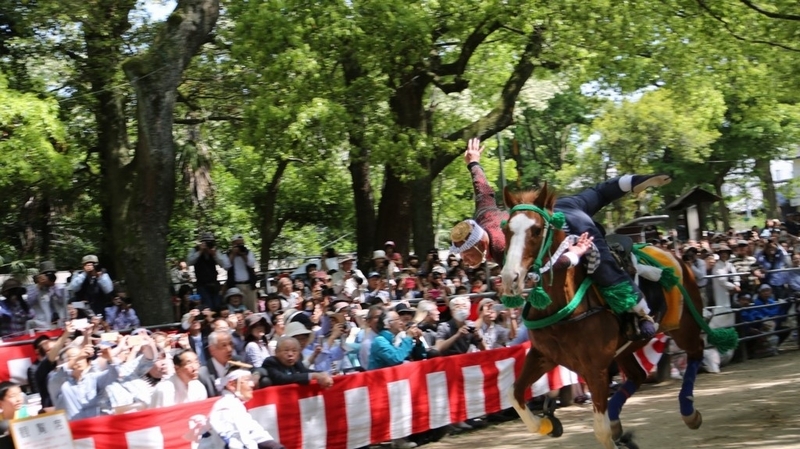 Fujinomori Matsuri Festival, 「藤森祭」 is held at Fujinomori Shrine every year from MAY 1 to MAY 5. During the festival, there are many food stalls in the precincts, and portable shrines are carried around the shrine. There are also Japanese drum performances, and a samurai parade. 9:00 to 16:00 on MAY 5 Procession of four portable shrines and samurai parade through the towns. 13:00, and 15:00 “Kakeuma-shinji” in the shrine precincts. Access : 5-ninute walk from Fujinomori station on the JR Nara line, or 7-minute walk from Sumizome station on the Keihan main line.